Do you remember the first time you shot an explosive barrel? That sharp blast not only heralded gamers’ infatuation with reducing enemies to pulpy puddles, it also laid the foundation for interactive environments in shooters. Clever gunmen have trained their sights on red barrels and other hazards for decades, learning the language of creative carnage. 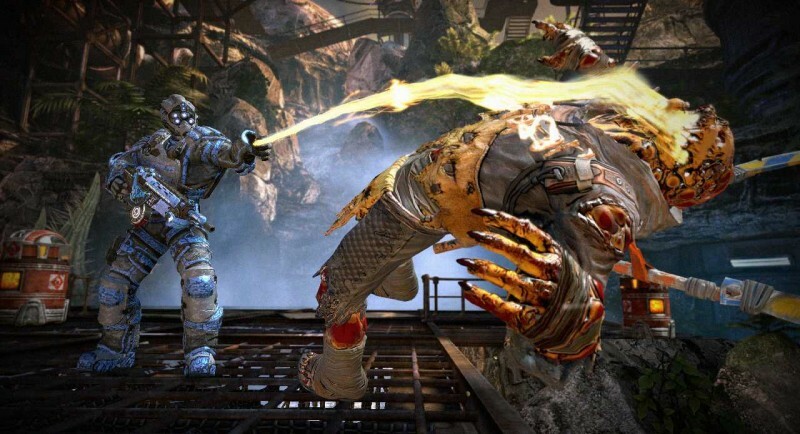 All you know about killing with style using your surroundings has been a prelude to the bloody playground of Bulletstorm. Going into a game called Bulletstorm I expected a paper-thin story as an excuse for nonstop murder. Instead, I was greeted with a humorous, potty-mouthed opening that fleshes out the dramatic crash-landing of ornery fugitive Grayson Hunt. His quest for revenge on corrupt military leader Sarrano is a goofy sci-fi romp that doesn’t deserve to have its cutscenes skipped. 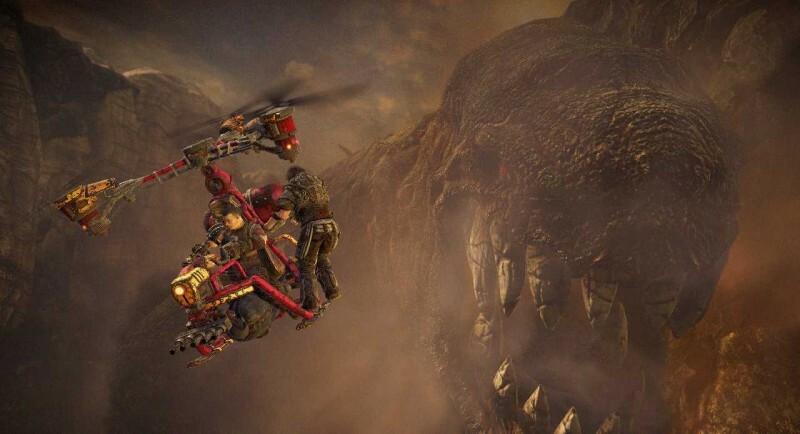 Bulletstorm offers a degree of character control I haven’t experienced in an FPS since Mirror’s Edge. Gray’s kick, slide, and leash allow him to move through and interact with the environment with fluidity. In other games, it would be unthinkable to pull a foe from across the map, strap him with explosives, kick him back into his buddies, and slide away while detonating the bloody mess. Amazing moments like this are easy to pull off in Bulletstorm. The slow-mo effect applied to enemies after being kicked or leashed offers the perfect window of opportunity to boot them towards electric wires or cacti, and the game has a predictive way of guiding the poor soul where you wish. There were only a few instances where I accidentally impaled some sad sack with rebar instead of feeding them to a carnivorous plant. Other than that, racking up points with creative skill shots is a reliably cathartic experience. Skillshots are necessary to gain points to spend on weapon upgrades and ammo, but they’re riotous fun in their own right. 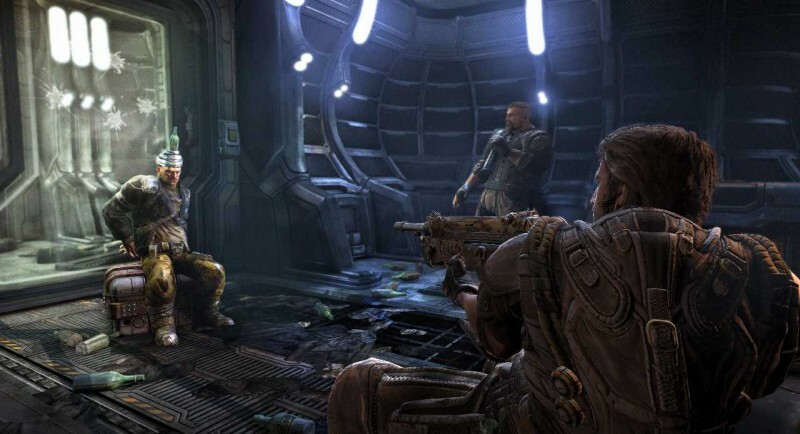 Working similarly to trophies and achievements, players earn hundreds of points by dispatching foes according to dozens of general and weapon-specific criteria. For example, the “French Revolution” skillshot is pulled off by decapitating multiple foes with a chain flail, and “Fan-tastick” is earned by launching a foe into the air and impaling him into the ceiling with a rotating spike, turning him into a human fan. The weapons themselves are some of the most creative and entertaining I’ve seen outside of an Insomniac title, including a quadruple-barreled shotgun that evaporates enemies like the playground scene from Terminator 2. 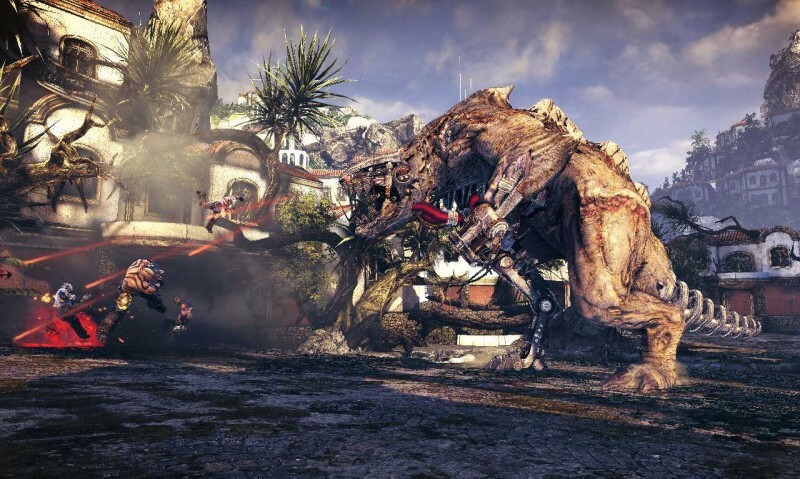 Combine these weapon challenges with the general thrill of combat and you’ll be hard-pressed to find a mundane encounter. When you’re not mowing through legions of foes, you’re dropped into larger-than life moments, like one that has Gray fleeing a tremendous runaway cog on a tram while you blast gas tanks to knock the wheel off course. In another scenario Gray giddily guides a remote-controlled Mecha Godzilla lookalike through a miniature city, blasting apart buildings and enemies. 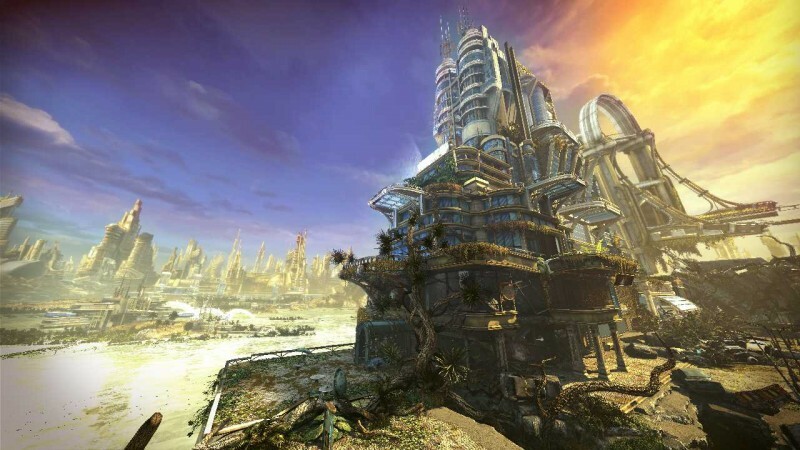 In addition to the single-player campaign, Bulletstorm offers Echoes and Anarchy modes. Echoes takes sections from single-player maps and lets friends compete with each other for the highest score. Knocking friends down the ladder is a nice distraction, but only score fiends will want to play this after beating the main game. Anarchy is a cooperative horde mode in which four players work together to earn skill points to progress through waves. Playing catch with foes using the leash and teaming up to kick a jerk into a gigantic dino’s maw is a good time, but the higher level waves are impossible without constant communication. Hooking up four consoles in a room among good friends is your best bet, but even then the handful of maps start to feel repetitive after your tenth time attempting to get past wave 15. 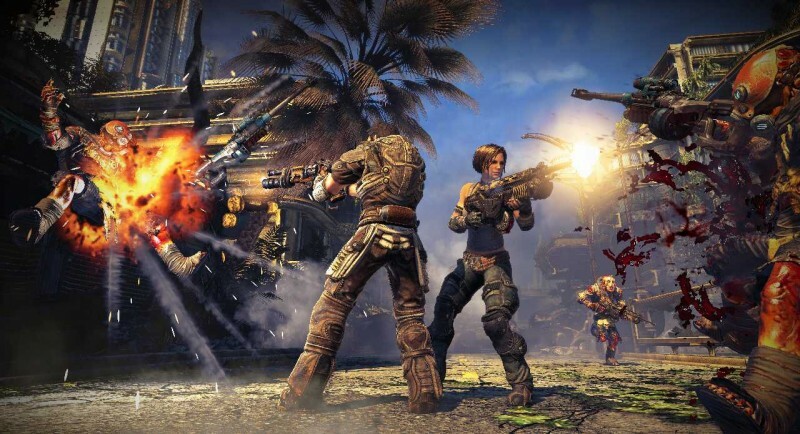 Bulletstorm is an exceptional shooter brimming with personality and originality, but the concept is spread too thin in the later levels. New homicidal toys are constantly introduced in the first three-quarters of the game, which makes the final few hours a little stale. Mix in a ho-hum ending and the stellar experience goes out on a bit of a low note. 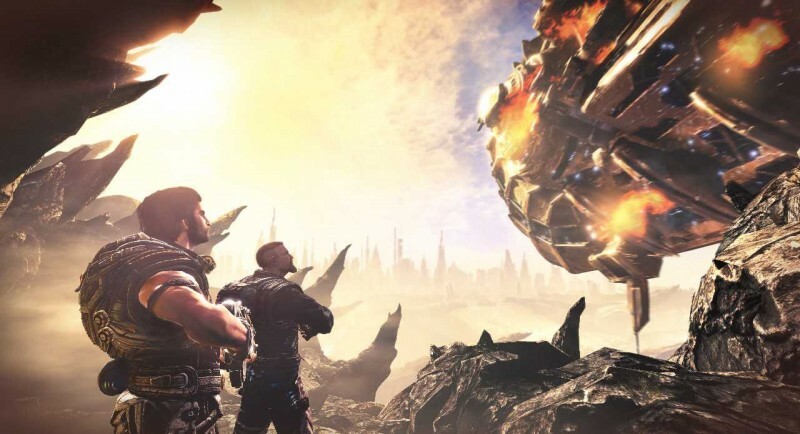 Small gripes aside, there’s no denying Bulletstorm’s blissful action. Epic Games/People Can Fly’s sadistic opus arrives at a time when most shooters do little more than let you blast dudes in the head while things explode. 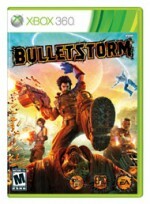 Bulletstorm has those things, but also lets you shoot a man in the testicles and kick slide his head off. 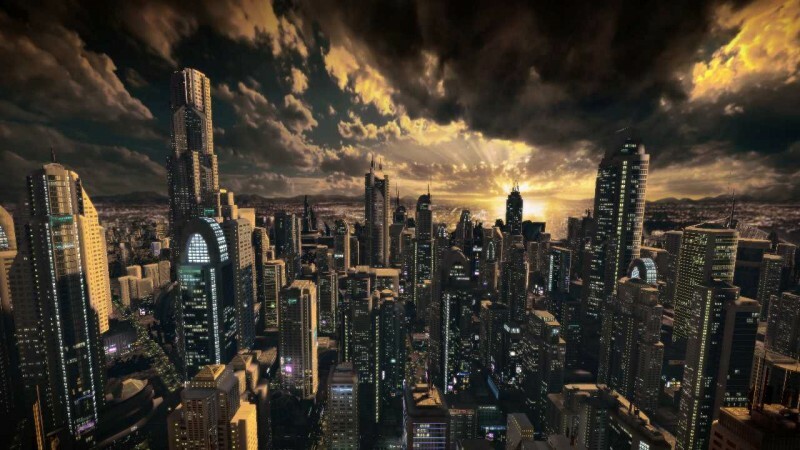 surroundings has been a prelude to the bloody playground of Bulletstorm.